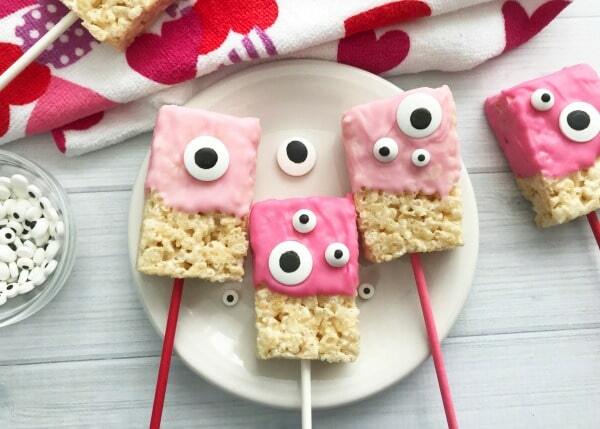 Valentine Rice Krispie Bars are such a fun and easy snack idea. Your little monsters will love sharing these monster themed Valentine’s Day treats with their friends. Whenever I pull out a package of candy eyes my kids get excited. 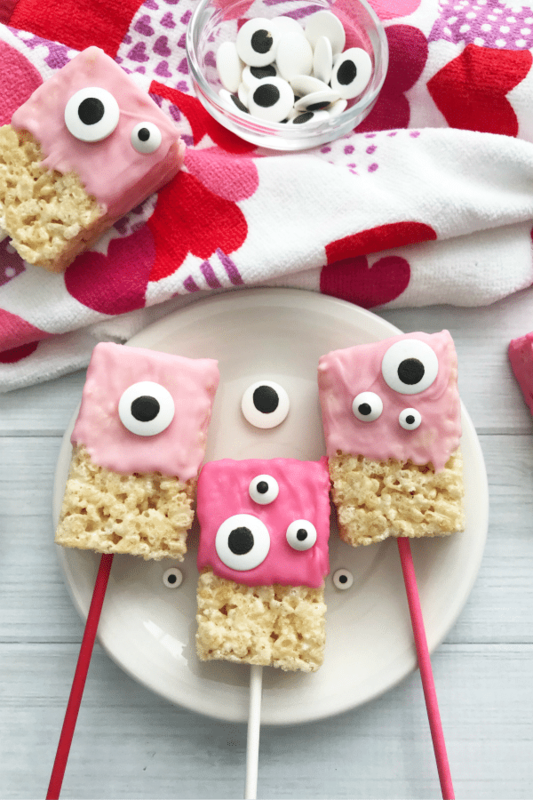 There are so many fun ways to use googly candy eyes and these monster themed Valentine Rice Krispie Bars are especially adorable. The great part of a monster themed snack is that boys and girls alike will line up to get one! This easy snacks goes hand in hand with the free printable monster themed Valentine Coupons I have available. Did I mention that this easy Valentine’s Day treat is a NO-BAKE treat? I love quick and easy recipes!! 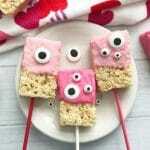 These Valentine Rice Krispie Bars are very simple to make and perfect for getting kids into the kitchen. It is also a very easy recipe to double or triple! Be sure to make extra because these are so tasty the kids will line up for a second one. Start by lining a baking sheet with parchment paper or wax paper. Open each Rice Krispie Bar package and discard the wrappers. 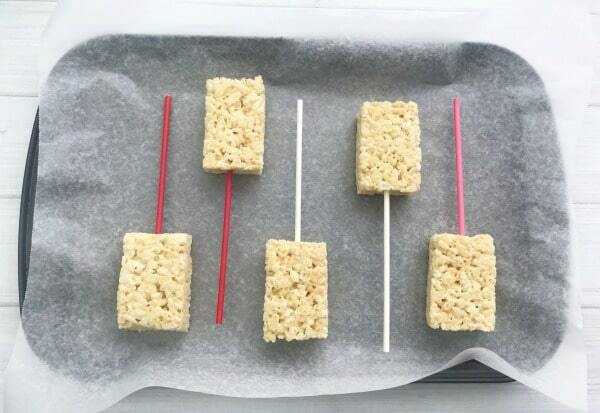 Insert a lollipop stick gently into the base of each Rice Krispie Bar and place it on the baking sheet. Put the baking sheet into the freezer for about 15-20 minutes. While the Rice Krispie bars are in the freezer go ahead and start melting the candy melts. 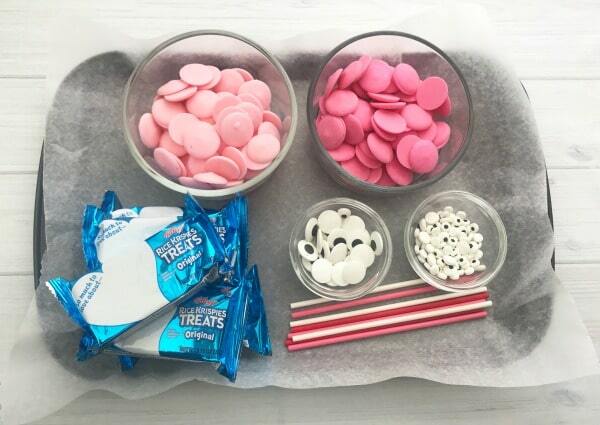 Place about 1/2 of each bag of candy melts into separate microwave safe bowls. Microwave one bowl at a time for 30 seconds intervals, stirring in between each interval until the candy is smooth and melted. Remove the Rice Krispie Bars from the freezer and begin dipping them one at a time in the melted chocolate. Dip the bar about halfway and allow any excess chocolate to drip back off into the bowl. Lay the bar on the baking sheet and add candy eyes in random places. Repeat until all the bars are completed. This recipe makes 8 bars. Allow the Valentine Rice Krispie Bars to cool completely. You can even place them back in the freezer if you want them to set up fast. These can be bagged individually in cute holiday cellophane bags and make perfect treats for school. They will also stay fresh longer if they are in a sealed bag! Ready to make a batch of Valentine Rice Krispie Bars? Here is the detailed recipe card for you to print off and keep. 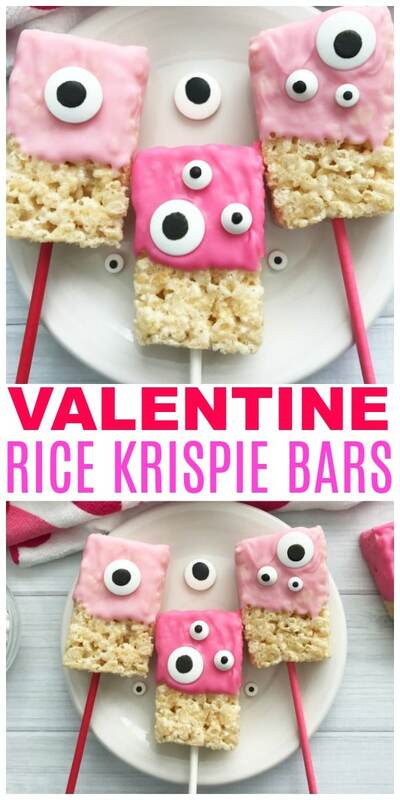 Valentine Rice Krispie Bars are a simple and delicious snack. 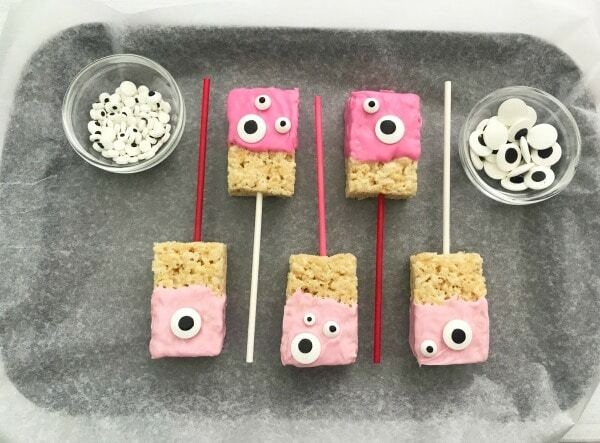 These fun monster themed Valentine's Day treats are perfect for class parties. Place each bowl in the microwave one at a time - heating for 30 second increments, stirring occasionally until melted. Let cool a few minutes. 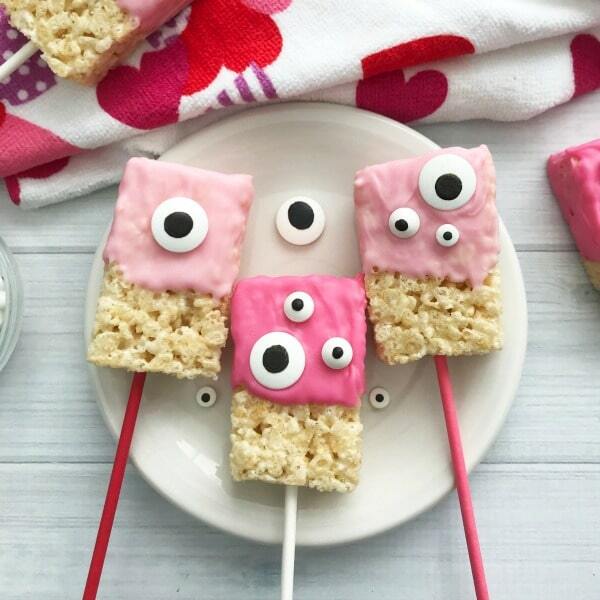 Be sure to PIN this Valentine Rice Krispie Bars recipe so you can make these again next year! What a unique rice crispy treat idea. Like the pink colors! Happy Valentine’s Day Corinne ! So cute and so easy! Kids would absolutely love these! These are so adorable! My niece and nephew would love these. Valentine’s are not only for adults, but for kids, too, yes? 😀 Thanks for sharing at Fiesta Friday party! So cute! Thanks for sharing at To Grandma’s House We Go DIY, Crafts, Recipes and More Link Party. I pinned this! Hope to have you join again next week. Have a great day!